Beamreach Solar, formerly Solexel, today announced the introduction of Sprint™, its new lightweight photovoltaic (PV) solar panel system for flat commercial roofs. Sprint's light weight allows it to be installed on nearly all commercial roofs that cannot currently support heavy conventional solar systems (which account for millions of commercial roofs around the world), dramatically expanding the commercial solar power market. The company will be exhibiting its new Sprint technology at Intersolar Europe this week in Munich, June 22-24. Beamreach Solar's new lightweight Sprint(TM) solar panel can be installed on millions of commercial roofs that cannot support heavy conventional solar systems. Sprint also features an innovative design that integrates racking into the panel, enabling an ultra-fast install process that is up to five times faster than conventional panels and racking systems, significantly reducing installation time and labor costs. 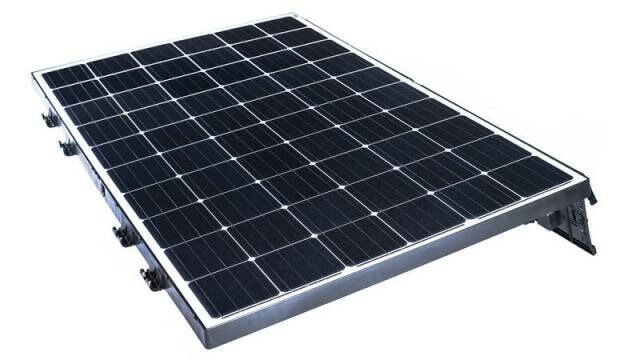 More Power: Featuring maximum power capacities ranging from 290 watts to 320 watts, Sprint can generate up to 20 percent more power than conventional solar systems. An Ultra-Fast Install Process: Sprint uses an innovative design that integrates racking into the panel, enabling an ultra-fast install process that requires no tools and no grounding. This allows Sprint panels to be installed up to five times faster than conventional panels and racking systems, significantly reducing installation time and labor costs. More Panels on the Roof: Sprint's innovative design also reduces the distance required between panel rows, enabling up to 30 percent more panels to be installed on a roof, increasing the solar system's overall energy output. Easy Removal and Reinstallation: Sprint panels can be easily removed and reinstalled, providing commercial roof owners with additional flexibility regarding their solar power investments. Lower Shipping Costs: Sprint decreases panel shipping costs thanks to its relatively high shipping density compared to conventional photovoltaic (PV) solar systems. "Sprint opens up new opportunities by overcoming weight restrictions, low power capacity, high labor costs and other obstacles that have prevented the global commercial rooftop solar market from realizing its full potential," said Mark Kerstens, CEO of Beamreach Solar. "Sprint expands the commercial solar market for installers, developers and roofers by allowing them to sell solar to commercial customers whose roofs previously could not support conventional solar systems and by helping them make solar more economically attractive to customers who previously were not interested in solar power." Sprint panels have been tested to support test loads up to 5,400 Pascals (Pa) and withstand wind speeds of 115 MPH. Sprint also comes with a 25-year linear output warranty and 10-year product warranty. "Beamreach Solar's Sprint gives us the advantage of reducing our labor costs while delivering added value to both our existing and new customers with roofs that could not support the weight of conventional solar systems," said Tony Diaz, president, Century Roof & Solar Inc. "The advantage of having the power density in this product and speeding up the installation time will give a great return on investment for our clients and give us an advantage in the industry." Beamreach Solar will be exhibiting Sprint at Intersolar Europe this week at booth A2-260. It will also be at Intersolar North America on July 12-14, Solar Power International (SPI) on September 12-15 and at other trade shows and conferences over the coming months. Installers, developers, roofers and commercial customers interested in learning more about Beamreach Solar's products can contact its sales department at [email protected].